There MV capactors units are used to build capacitors banks for reactive power compensation on medium voltage and high voltage networks. There capacitors are available in 1 Phase and 3 Phase construction with or without internal fuses. Our Capacitor unit is designed for heavy duty operation in Fixed, enclosed and pole mount banks in all condition. The Capacitor units is a single phase and three phase power capacitor of all film design, with very low dielectric losses and a long life. Each capacitor has several elements that consist of a dielectric of polypropylene film and Aluminium foil, which are connected in series and parallel group into an internal star or delta configuration. Medium voltage capacitors are manufactured in two different versions either for use with external fuses or already fitted internal fuses. Capacitor tanks are made in stainless steel material with fixing brackets for mounting.The capacitors are painted with two component EPOXY treatment for long withstanding capacity for environments. ENERGE Medium voltage Capacitors are described “100% All Film Capacitors”. That capacitors have low loss material. Due to the that fact, ENERGE CAPACITORS are long lasting. Capacitors are designed and 100% tested to meet the international standards. Each capacitor element has the possibility of having a separate internal fuse. In addition, each capacitor unit is provided with an internal discharge resistor. All Medium voltage power capacitor units are light-weight and have low losses. They comply with most national and international standards. M.V. power factor correction is directly related to the technical management of transmission and distribution networks. 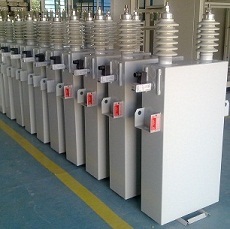 Increasing voltage levels in busbar sets in substations and at the end of lines. About Energe Capacitors Pvt. Ltd.
"Energe capacitors Pvt Ltd" established in the year 1982, is an ISO 9001 – 2008 certified company manufacturing Power Capacitors and all associated equipments upto 220 KV. Energe group provides superior capacitor technology for reactive power compensation with its own research & development. By testing high performance raw material and state of its art manufacturing process, our products achieve the highest ratings and long working life. Their manufacturing plants and Head offices are located in Rajapalayam which is a world-famous textile hub in south India at Rajapalayam. This town is in close proximity to the Western Ghats. Their factory has well transport access by road, rail and airway. It takes just 1 hour drive from Madurai Airport. We have two optional sea ports for easy & timely exports. They believe in Engineering Excellence with focus on fast development and innovations. A well balanced mix of sophisticated machines and team of expert engineers enables us to offer the products for reactive power compensation. They are driven by Process Techniques and Total Quality Management towards achieving Total Quality Assurance to meet customer satisfaction. 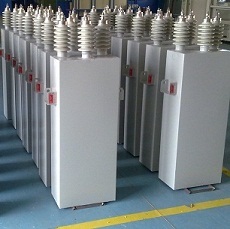 In 2013, 272 sets of 2 MVAr capacitor bank supplied to utility company, Andra. In 2012, 14 MVAr, 33KV Metal enclosed capacitor bank supplied to utility company, Mumbai. In 2008, Incorporated precision C & Tan d meter in our testing lab. In 1999, the company supplied its 4th & 5th MV harmonic filter to WWCR steel mill, Chennai. In 1978, the company took up sole distributorship of low voltage electrical products of strong and reputed brands.